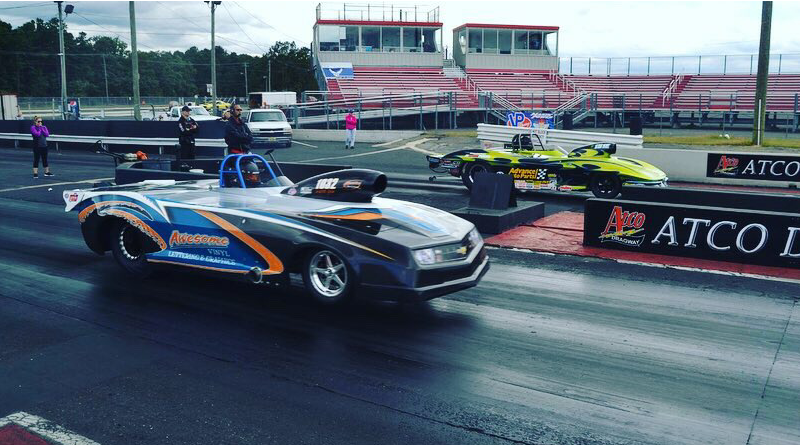 Atco Dragway, Atco, NJ – The Direct Cabinet Sales Mid Atlantic .90 Association presented by VP Race Fuels will kick off it’s 2019 season in a few weeks at the famed Atco Dragway in Atco, NJ on April 27th & 28th. The series which consists of all the .90 classes featured on the NHRA tour will be entering its 7th season with a double-header the weekend before the PC Richard National Open Series that will also be held at Atco. Looking at a preview of each class. In Super Comp, 2018 Champion Don Bangs will be looking to claim his 3rd championship in the series after a successful campaign last year. Bangs took 2 event victories on route to the championship and his 2nd Championship to go along with his 2014 Series Claim. It won’t be easy for Bangs though as 2017 Champ Amanda Boicesco, Bill Hardifer, Randy Winfelder Jr. and many others will be looking to knock the champ off and prevent a 3rd championship from going home to Southampton, Pa. In Super Gas, defending champion Nick Olt will be looking to capitalize off a great 2018 season that saw him claim the championship in his first year running for points with the series. Olt, capped a great 2018 season with wins at his home track of Atco at the 2nd event of the season and a runner-up at the following event in June. Olt, will be followed closely by Al Owens, Frank Volpe and the veterans of the 9.90 category in multi-time champions Tom Goldman, Iggie Boicesco & George Smith that will certainly not make it easy for a back to back championship for Olt. Shifting over to the 10.90 category of Super Street. In a thrilling finish to last years championship battle that saw Dom Burgese take a winner take all final for the championship over Keith Mayers. Burgese, claimed his first championship with 2 wins and a runner-up to be the last man standing in the tough series. It won’t be easy though as 3x Champion Mayers will be looking to add his 4th championship to his resume after being shut out the past 2 years and the Ever-tough Rick Mattioli, Sean Lanigan and 2017 Champ Martin Ganjoin will be looking to break through and cause a little havoc at the top and knock Burgese and Mayers off the top to claim the Top Dog prize. Gates will swing open on Friday, April 26th at 5pm for a track operated Test & Tune ($25.00) for anyone that would like to shake the cobwebs off to dial in their cars from the winter break. The Test & Tune will last till about 10-11pm and spectators are ($10) even if you are parking for the night. On Saturday the 27th, Gates open at 8am with racing kicking off around 9am. There is a Buick, Olds, Pontiac event that will be out first followed by Q1 of the .90 cars. Gate fee is $30.00 for car & driver and $80.00 paid to the Mid Atlantic .90 Trailer to run with the series per day. Find more news from the Mid Atlantic .90 Association here. All registration and tech inspection must be done before you make a pass down the track and if you’d like to run for the yearly points fund that is $75. The series counts your best 7 out of 10 events towards the championship. There will be two qualifying runs and 1st round will be set on an NHRA Sportsman Ladder and the race will be run till completion on that day. A Summit ET Series Bracket event will be held also that day beginning at 1pm which will feature Junior Dragsters, Junior Street, Sportsman, Pro & Super Pro and all .90 racers are free to double-up if they choose. The 2nd Annual Beth Keister Memorial Meatball Feast will be the highlight of Saturday Night and the BBQ is in honor of President Rob Keister’s Stepmom who passed away from Cancer in 2017. All racers and crew are welcome to join in and enjoy a meatball sandwich in honor of a long-standing tradition. On Sunday, Gates will once again open at 8am with racing beginning at 9am. Depending on the new car entries for that day, 1 or 2 time runs might be the option to get racers on the road and home at a decent time for that dreaded Monday work day. The program will run like Saturday’s program except it will be a little lower key with only points for Motorcycles, Atco Nostalgia and a Chevy vs. Ford event to highlight the day along with the .90 cars. Payouts are based on car counts and payout window opens beginning at 3rd round loser at the .90 trailer. The series has also added some great contingency partners to offer up product gift certificates to our winners and runners-up of each event. Companies such as Comp Cams Inc., Auto Meter, Meziere Ent., Lucas Oil / JKR Racing, Crew Chief Pro, Dewzen Inc & Manley Inc will offer up rewards for the racers towards purchases of their products which will equal up to an additional $500 in contingency to the racer. Also new for 2019, is the “Last Man Standing” in which racers have the option to put an additional $10 into a separate pot per class and the racer who goes the farthest in eliminations who participated will receive the pot along with their winnings. For more information you can visit the website at www.midatlantic90.org or find them on the social media outlets such as Facebook, Instagram and Twitter and if you can’t make it to the events all races are televised via the Facebook Live App beginning 3rd round of each event. Any questions can be directed to president Rob Keister at 856-332-2851 or rekeister@aol.com.